The Sailing World Cup Qingdao offered exactly what some sailors were expecting, and others were not expecting at all, on a light wind day one. The seasoned performers and Qingdao returnees in the Sailing World Cup fleet got more of what they have come to expect from the waters of the Beijing 2008 Olympic Games. 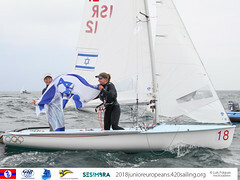 However, with an open entry list some sailors took up a new challenge that was presented to them in the search of new skills. A challenge welcomed with open arms. From racing in international fleets with top class sailors to dealing with a new condition and sailing element, Sailing World Cup Qingdao welcomed all comers to take what they need to out of the regatta. Some were learning new skills, some sharpening their old ones ready for a showpiece final. Twenty-five 470 teams from China, Chinese Tapei, Hong Kong, Italy, Japan and Sweden are competing. With a perfect start to the Sailing World Cup Qingdao, China's Mengxi Wei and Yani Xu sit on top of the Women's 470 fleet with two points. 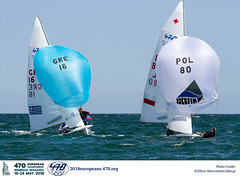 Obviously enjoying the home waters, the pair already have a five-point advantage over nearest rivals Shengnan Ni and Lizhu Huang (CHN) at the end of the first day. Ni and Huang scored a 3,4 to end on seven points but will hope that the coming days are not dominated like day one by their compatriots. Just behind in third overall is Nan Zhang and Xiao Lu (CHN) who scored a second place and sixth place finish. Again Zhang and Lu will have to come out fighting to ensure that Ni and Huang don't run away with from the fleet. China's Hao Lan and Chao Wang lead the way in the Men's 470 fleet with a solid first and second place finish in the two races of the day. Giving them three points, their nearest rivals are Liangdao Weng and Youjian Wen who sit in second and two points back from Lan and Wang. Their five-point total is made up of a bullet and a fourth place. 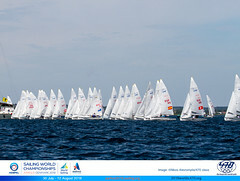 A small gap has opened already at the top with third placed Mingliang Ding and Hongri Liu five points adrift of second. A second placed finish in the first race of the day was followed up by a ninth place to give them 11 points in total. Japan's Sho Kaminoki and Taisei Hikadi and Italy's Simon Sivitz Kosuta and Jas Farneti make up the top five. Both teams have 13 points.